Canning Town Glass was a little-known bottle maker that made some fascinating Carnival. 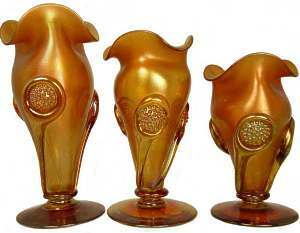 Above is a marigold Thistle vase, and part of the original mould (which is kept at Broadfield House Glass Museum, Kingswinford, England). 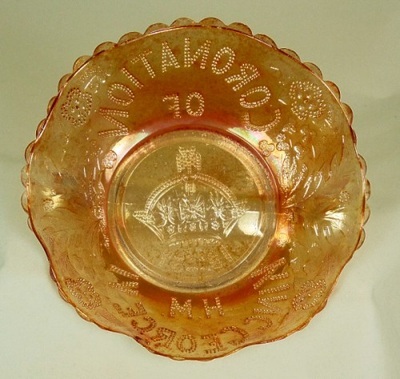 In Carnival Glass, The Magic and The Mystery, we tell the story of The Wear Flint Glass Works factory and its successive owners, Greener & Co. and James A. Jobling. 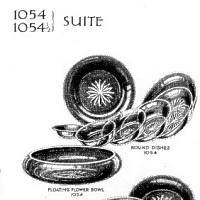 An ad in the British Pottery Gazette in 1935, appears to illustrate an iridised black amethyst Jobling's 1054 bowl just like the one shown above, raising more questions. 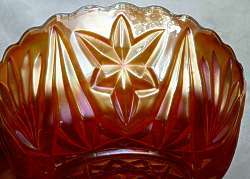 The maker of the May baskets like this Maple Leaf was a mystery. We believed that the maker was English, and our discovery of pages from a 1930s Matthew Turnbull catalogue provided the evidence - it shows Basket No. 480 - a May basket. A eureka moment! We have since identified many more Turnbull patterns: the links are below. 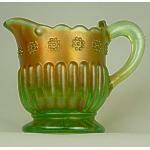 Did Edward Moore make Carnival Glass? If they did, were they years ahead of Fenton in the USA? Read the evidence! Read and See More about English Carnival makers - click on any image. Turnbull - the Eureka moment! Did Edward Moore make Carnival?